Odisha Police Syllabus 2019: (ओडिशा पुलिस पाठ्यक्रम पीडीएफ, डाउनलोड कॉन्स्टेबल, एसआई परीक्षा पैटर्न, परीक्षा योजना) The Odisha Police Headquarter will conduct the Odisha Police Recruitment 2019 process for the Sub Inspector, Constable, Assistant Sub-inspector and other posts. The candidate’s selection will be based on written examination, physical test, and Interview. For the Police Examination, Odisha Police Written Syllabus is providing here with complete details. Candidates can directly Download Odisha Police Service Exam Syllabus via the official website of Odisha police. For the good exam preparation, candidates can get Odisha Police SI Exam Pattern and can get an idea about the examination strategy. Odisha Police Constable Exam Pattern is usable for each candidate who is preparing for Odisha Police Examination. In the table given below, we are sharing details about the Odisha Police SI Exam Syllabus and Pattern with their subjects, exam type, marks distribution and time details. In the Exam preparation, the exam syllabus plays a very important role and it gives the full support for best preparations. The provided syllabus & pattern will use you to obtain good marks in the examination. For your good preparation, we provided the Odisha Police Previous Papers here. Candidates go to the official website and can directly download the exam syllabus and pattern for Odisha police exam. 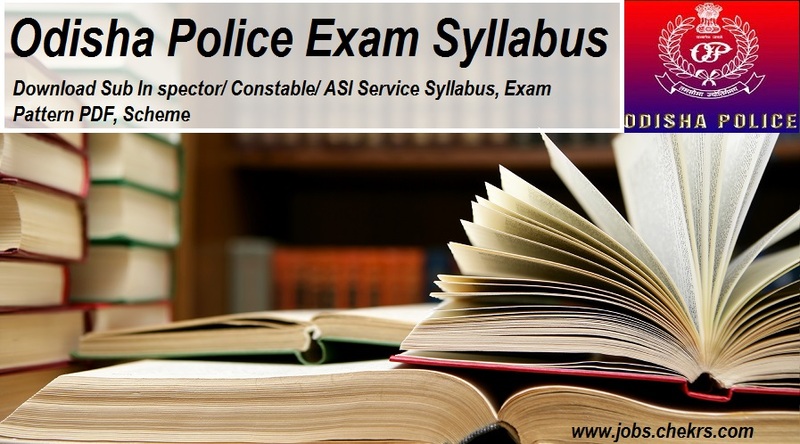 Candidates are advised that they should be concentration on Odisha Police Constable Exam Syllabus 2019 and check the important topics which are cover under the mention subjects. English Tenses, Articles, Verb & Adverb, Conclusion, Error Correction, Vocabulary, Grammar, Subject, ­Verb Agreement, Synonyms, Antonyms, Word Formation, Passage Completion, Theme detection, Idioms & Phrases, Comprehension, Sentence Completion, Fill in the Blanks, Sentence Rearrangement, Unseen Passages. Arithmetic Number System, Whole Numbers, Negative Numbers and Integers, Fractions Exponents, cube root Profit & Loss, Compound Interest Discount, Algebra.Introduction to Algebra, Ratio, and Proportion, Geometry, Basic geometrical ideas (2-D), Understanding Elementary Shapes, Symmetry, Constructions, Quadrilateral, Mensuration, Data handling, statistics also. General Knowledge Indian Constitution, Awards and Honours, Current events Books, General Politics, Current Affairs – National & International, Abbreviations, Important Days, Important Financial & Economic News, Books and Authors, Science – Inventions & Discoveries, Sports, India And Its Neighbouring Countries, Culture, History, Economics Scene, Geography, Scientific Research etc. Aptitude Problems on Trains, HCF & LCM, Line Graphs, Mensuration, Percentages, Profit and Loss, Simplification, Number System, Probability, Pipes & Cisterns, Decimal & Fractions, Time and Distance, Problems on Ages, Boats & Streams, Volume & Surface Area, Mixtures & Allegations, Ratio and Proportions, Permutation & Combination, Time and Work, Heights & Distances Partnership Simple & Compound Interest. Logical Reasoning Arrangements, Decision Making, Syllogistic Reasoning, Statement-Conclusion, Directions, Non-Verbal Series, Problem Solving, Number Series, Coding-Decoding, Clocks & Calendars, Analogies, Alphabet Series, Visual Memory, Number Ranking, Arithmetical Reasoning, Blood Relations, Cubes and Dice, Embedded Figure, Mirror Images. We will regularly provide you with the latest Notification on Odisha Police Vacancy 2019 post and Odisha Police Exam Pattern. In the case of any query or review, you can place your valuable comments in the commenting section below. We will revert you in a short while.